Event Description : EXHIBIION "स्त्री | Women" group art show on the Occasion of Women's Day. UN is celebrating International Women’s Week during the first week of March 2018. Series of programmes are being organised partnering different reputed Organisations. It brings us immense pleasure to inform you that United Nations is supporting shOObh Group Welfare Society – which has recently been accepted as a partner NGO to the UN ECOSOC - in their heartfelt endeavour to celebrate womanhood. 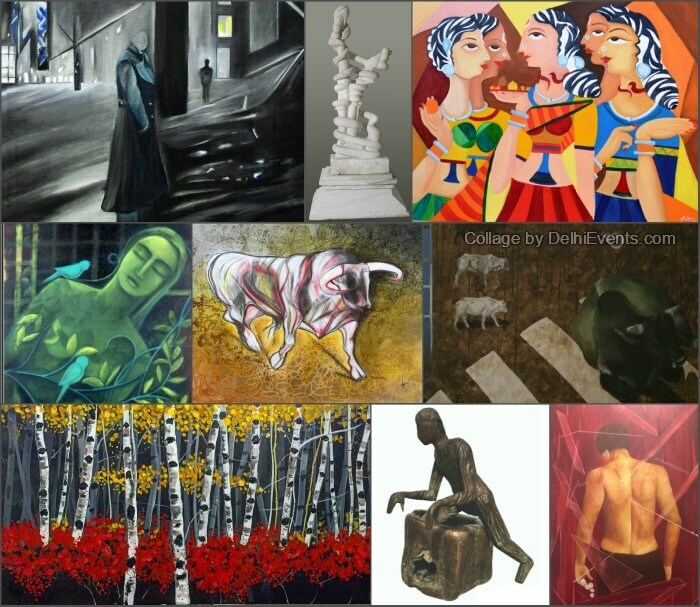 On the occasion of women’s day, a group art show in which women artists will showcase their artworks. The artwork of these women artist will showcase empowerment of women, strength, versatility, patience and motivation to bring prominent positive changes in the society. Women artists participating in the show are Ranjeeta Kant, Kiran Soni Gupta, Shuchi Khanna, Aarrti Zaveri, Rubkirat Vohra, Gitanjali Kashyap, Ritu Mehra, Supriya Seth, Sunayana Malhotra, Neeraja Dave, Nupur Kundu, Shruti Gupta Chandra, Bipasha Sen Gupta, Vimmi Indra, Dr.Amrit Kapoor, Sheela Chamariya, Sangeeta Gupta, Kanchan Chandra and Nin Taneja. These recognizing artists have been awarded timely for their extraordinary work and contribution in the field of art. These recognizing artists have been awarded timely for their extraordinary work and contribution in the field of art. It’s incredible and unbelievable that a woman plays various roles and that too with love and full enthusiasm. “Woman”, she is a mother, a sister, a wife, a daughter and the most dedicated employee at her work place. She is indeed the pillar of the society on whose shoulder there is the onus to take forward the existence of mankind in a smoother way. She is generous, passionate, and audacious and she knows an absolute solution to all the problems. International Women's Day is a global day celebrating the social, economic, cultural and political achievements of women. The day also marks a call to action for accelerating gender parity. International Women's Day is a collective day of global celebration and a call for gender parity. International Women's Day is all about unity, celebration, reflection, advocacy and action - whatever that looks like globally at a local level. International Women's Day has been occurring for well over a century and continue to grow from strength to strength.